Lactibiane Tolérance consists of 5 concentrated microbiotic strains in the dose of 10 billion bacteria per 2,5 g sachet or per capsule. 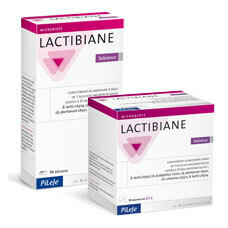 The set of 5 bacterial strains selectively bred for Lactibiane Tolérance conforms to all our quality criteria. Microbiotic strains in Lactibiane Tolérance selectively bred by PiLeJe are registered in the National Collection of Microorganism Cultures (CNCM). Potato starch, dextrose, chicory root inulin, maize maltodextrins, lactic ferments. Bulking agent: corn starch, lactic ferments (on a maltodextrin carrier), capsule of plant origin, anticaking agent: magnesium stearate.